A former collegiate athlete turned full-time adventurer and healthcare professional, Kelly is an inspiring yet humble voice of resilience. Her experiences have taught her that with a little creativity, ingenuity, and passion that adventure can be accessible to anyone. At a glance, Kelly is a prototypical Portland young professional. She’s environmentally conscience and can’t remember the last time she drove a car. She loves riding her bike and walking the daily 2-mile commute to work. Evenings are often spent with friends enjoying local craft beers at the neighborhood brewpub. Weekends are full of outdoor activities like camping in the forests of the Columbia River Gorge. Kelly grew up in the Midwest and had a childhood full of sports, friends, and family. With a passion for softball, Kelly excelled during her high school career and was noted by many to have a very promising future as a collegiate athlete. Kelly’s first interaction with a sports related injury came during her senior year with torn ligaments in her knee. It was the first of several instances in her life where she was forced to take time to re-examine the relationship between herself and her body. Kelly managed to make a full recovery and went on to continue playing collegiate softball and also became an active member of her club rugby and football teams. Even with the demands of long hours of training as an athlete, Kelly excelled in her studies. From early childhood, she knew she wanted to work as an occupational therapist. When a close member of Kelly’s family was born prematurely she became a primary caretaker. From this experience she realized helping people with disabilities was her calling. As fate would have it, during a softball practice in the spring of 2000 Kelly once again experienced a traumatic injury. This would be the fourth time she would need reconstructive knee surgery. This time when she re-evaluated her athletic pursuits she decided that high impact sports like softball, football, and rugby were not congruent with her long term well-being. After a successful recovery, Kelly decided to take on cycling as a way to keep herself physically fit while avoiding the unpredictable injuries common with ball sports. Kelly completed her undergraduate studies and took a job with a hospital in Chicago, Illinois. After a few years enduring the harsh winters of the windy city, Kelly decided a change of pace was in her future. She took a trip to Portland and fell in love with the city’s focus on the outdoors and its bicycling culture. Since moving to Portland, Kelly has become a vital asset to the trauma center team at Emanuel Hospital. For the past 8 years, she’s worked with hundreds of patients who’ve experienced life-altering injuries. Many of Kelly’s patients can no longer live independently and often are wheelchair users. Everyday she helps people adjust to living with their new disabling life conditions. It was through her work that Kelly first met her now fiancé, Seth McBride, during a wheelchair rugby training camp in Brazil. They stayed in touch and reunited again at the 2008 Beijing Paralympic Games. Seth, along with the U.S.A national wheelchair rugby team, went on to win gold. After moving to Portland, Seth and Kelly’s bond deepened and they began traveling around the world spending a few weeks in New Zealand, a month in Ireland, and some time in Vietnam, Italy, and Thailand. These adventures almost always involved cycling, the sport they grew to love together. The trips showed that a dedicated partnership could make most any place accessible to people living with disabilities. 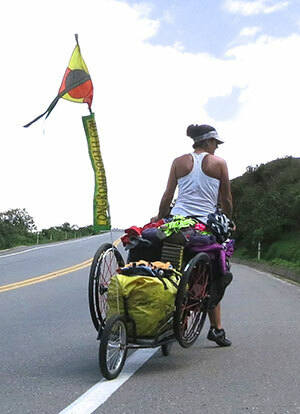 It was this partnership that allowed Kelly and Seth to complete a 10,000 mile self-supported transcontinental journey from Portland, Oregon, to Ushuaia, Argentina (the southernmost city in the world). The team effort was the key component to the couple’s success in their 315-day sojourn across two continents. Join us on May 2nd at TEDxMtHood to hear Kelly’s talk about the process of making adventure a part of life. George Mihaly is a Portland based video producer who enjoys drinking tea, practicing handstands, and bringing people together.